Sygate Personal Firewall Pro by Sygate Technologies, Inc. automatically protects your PC from hackers and other malicious attacks. It includes full-ICS support, protocol driver-level protection and enhanced logging. This firewall can stop intruders from hacking into your system, and that’s the point with a firewall. But Personal Firewall Pro doesn’t offer all the perks that our top ranked products do to block ads, popups and other undesirable content online. 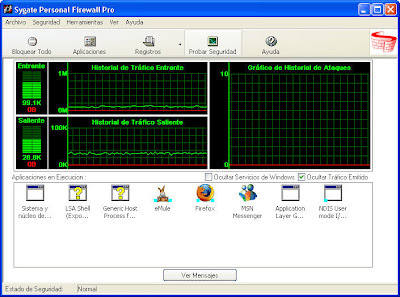 Sygate Personal Firewall is also a challenge for beginners. Sygate’s Personal Firewall control panel has an informative graph that details incoming and outgoing traffic as it is blocked. The program also offers an attack history graph, helpful for tracking intrusion trends. Sygate Personal Firewall Pro’s control panel allows you to view and manage running applications so you can instantly stop a data transmission if you want.